Paul George and the Pacers have won five in a row. INDIANAPOLIS — The Indiana Pacers had to wait a little longer than usual to pull away for yet another victory. Kyrie Irving and the Cleveland Cavaliers were left fretting over an MRI on the star’s left knee. The Pacers (25-5) have won eight in a row over Cleveland, their longest active streak against any opponent. Instead of opening up a nice lead in the third quarter, as is their tendency, they limited the Cavs to 3-of-16 shooting and forced seven turnovers in the final period to seize control. Cleveland (10-21) dropped its sixth straight but hopes Irving was not lost, too. After missing a fast-break layup late in the third quarter, Irving went down and clutched his knee. Seconds later, a foul led to a timeout and Irving struggled to leave the court. Cavs coach Mike Brown hustled over to check on Irving when the third-year point guard sat around midcourt. "I thought the worst happened," Irving said. "I felt something pop in my knee. I was falling down around all over the place. It was a painful experience." Irving was helped to the locker room with 4:01 remaining in the period, but returned with 9:27 left in the game. Still, he said the knee "didn’t feel right" after that and an MRI was scheduled for Wednesday. Anderson Varejao led Cleveland with 14 points and 11 rebounds. Irving was a limited factor even before the injury, finishing with 10 points, five rebounds and five assists. The Cavs shot 36.2 percent from the field and committed 15 turnovers. George Hill had 13 points and six rebounds for the Pacers, who have won five in a row and sent the Cavs to their eighth straight loss in Indianapolis. Indiana won the fourth quarter by a 26-10 margin. "We played better defense, played smart and hit the open man," said Lance Stephenson, who had a game-high eight assists. "We were protecting the rim. Everybody was in their gaps and G-Hill did a great job on Kyrie Irving." Cleveland had six turnovers in the first 6 minutes of the quarter, including giveaways on three straight possessions by reserve center Tyler Zeller. "You have to give credit to Indiana for turning it up a couple notches and taking us out of whatever we were trying to execute," Brown said. "For three quarters we played the game the right way. Turnovers hurt us in a low-scoring game. That’s very frustrating." For most of the afternoon, it was anybody’s game. The Cavaliers led 17-9 on Earl Clark’s midrange shot with 4:22 left in the first quarter. But the Pacers’ reserves dominated their Cleveland counterparts in a 10-3 surge that put Indiana ahead 35-34 on Danny Granger’s finger-roll with 4:57 left in the half. Granger matched a season-high with 12 points, including eight in the second quarter when the benches were matched against one another. 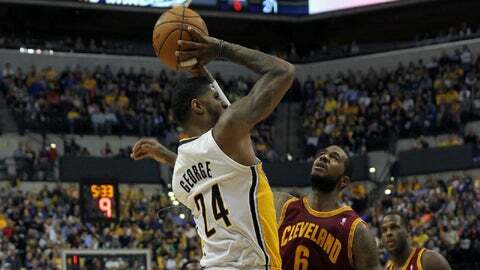 Hibbert’s jumper with 3:22 left in the half gave the Pacers a 39-37 edge, before the Cavaliers settled down and rallied. Dion Waiters’ driving layup with 26 seconds to play gave Cleveland a 44-41 halftime lead. George hit a 3 to tie the game at 63 late in the third. Indiana made 11 of 21 shots in the period but trailed 66-65 entering the fourth. To that point there were eight ties and 15 lead changes. The tenor of the game changed drastically from there. "What happened tonight was a credit to what the Cavs did," George said. "They played with a lot of energy. They played a good game." The Pacers put together a 15-6 run to take an 80-72 lead on Hill’s layup with just under 7 minutes left. Cleveland never got closer than six the rest of the way. George’s emphatic dunk put Indiana ahead 91-74 with 2:41 to play. "That was probably the easiest basket of the night," George said. NOTES: Indiana began a 10-game stretch in which it plays nine teams with losing records. The Cavaliers have just two road victories, tied for the fewest in the league. Indiana trailed after three quarters for only the sixth time this season. The Pacers have held seven opponents under 80 points, including Cleveland twice.